California activists turn to the cannabis industry to help launch the nation’s first public bank in nearly a century. 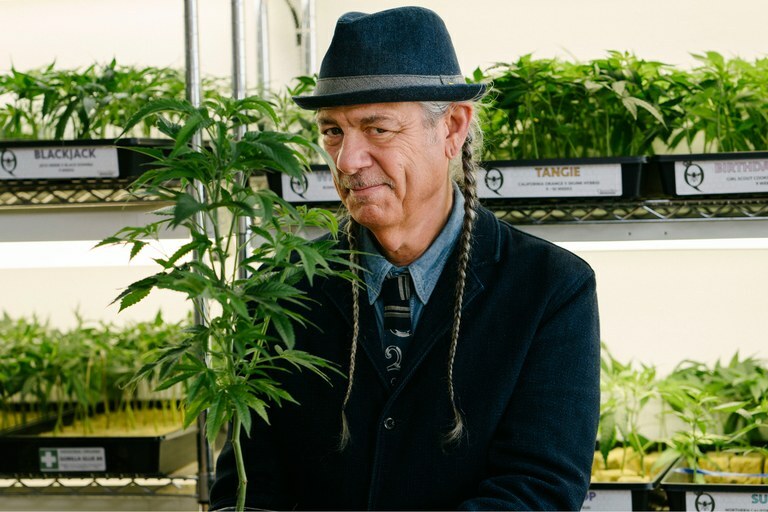 Steve DeAngelo, co-founder of Harborside Health Center in Oakland, California, and former star of the Discovery Channel's Weed Wars. DeAngelo says his dispensary handles more than $20 million in cash annually. Last October, a couple from Philadelphia traveled to Sebastopol, California, a quiet outpost some 50 miles north of San Francisco, to buy pot. They’d arranged the deal beforehand, but at some point during the hourlong transaction, the mood soured. Gunfire shattered the mild night. When it was over, two men were dead, a woman was critically injured, and 100 pounds of marijuana and $100,000 to $200,000 in cash were reportedly missing. The killers remain at large. Now, Kaplan and activists in Oakland are inching toward a potential solution: a city-owned public bank that would service a chunk of California’s $7 billion cannabis industry and support the local economy without having to rely on Wall Street. The idea has recently packed community forums and sparked interest from neighboring Bay Area mayors. If it succeeds, Oakland will become the second place in America — and the first in nearly a century — to establish a public bank. Stacy Mitchell of the Institute for Local Self-Reliance, a community development nonprofit, predicts that “once one place does it, other places are going to follow much more rapidly.” The endgame is both a boon to the cannabis industry and a new economic model in which communities can call on local banks to fund infrastructure and low-interest loans. The 98-year-old Bank of North Dakota is currently the country’s sole public bank. It operates as an extension of the state itself — managed by the governor, attorney general and agriculture commissioner — with a $4.3 billion loan portfolio and $7.4 billion in assets. There are no branches or ATMs, since its aim is not to compete with local banks but to partner with them by expanding their lending capacities. The institution’s annual reports read like socialist case studies: funding for schools, daycare, veterinary clinics, dairy farms, low-interest student loans and infrastructure projects. The bank has been an unlikely success in a conservative state. In 1997, for example, the Red River in Grand Forks flooded, triggering a fire and property losses totaling more than $3.5 billion. The Bank of North Dakota, then led by future Republican governor John Hoeven, suspended mortgage and student loan payments for six months after the disaster — a courtesy almost no Wall Street behemoth would extend. Interest in public banks has seesawed over the years, but it spiked after the 2008 financial crisis and subsequent Great Recession. Occupy Wall Street intensified grassroots campaigns for financial reform. In 2011, a California bill that would have authorized a task force to study the feasibility of a state-owned bank passed the legislature, only to be vetoed by Gov. Jerry Brown. More recently, activists in Santa Fe, Philadelphia and Vermont have rallied for public banking, and New Jersey Democratic gubernatorial candidate Phil Murphy has pitched a public bank in that state. Bags of medical marijuana sit in the locked vault at Harborside Health Center. An employee counts cash in a guarded room at Harborside Health Center. Harborside calls itself the largest medical marijuana dispensary in the United States, with more than $20 million in revenue annually. Harborside Health Center co-founder Steve DeAngelo holds some of the cash revenue from the company's safe. Momentum behind public banks is surging, particularly given a White House determined to roll back environmental regulations, defund sanctuary cities and crack down on immigration. Communities across the country want banks to defend their values. On March 14, San Francisco’s Board of Supervisors unanimously passed a resolution calling for the city to divest from financial institutions that bankroll the Dakota Access Pipeline. This follows similar divestments in Seattle, Washington, and Davis, California, as well as a national “Defund DAPL” campaign. Jeremy Lybarger is a journalist in San Francisco. His work has appeared in Rolling Stone, Mother Jones, Esquire, The New Republic, Pacific Standard and other outlets.